This article was opened on Tuesday 6 February 2007, and closed on Thursday 30 July 2009. 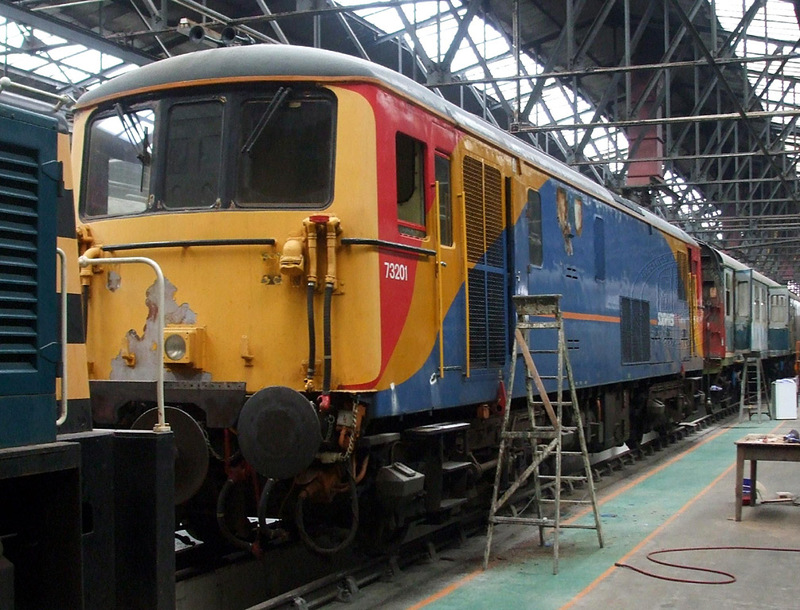 Above: South West Trains’s Class 73 electro-diesel locomotive poses in St. Leonards Depot yard alongside Southern’s Class 171 DMU, on 13 June 2006. All photos by Andy Armitage. This article has now been closed as it is rather full. A new article has been opened which follows on where this one leaves off. St. Leonards Depot is leased and operated by St. Leonards Railway Engineering Limited (SLREL), which is HDL’s sister company. This article is intended to illustrate the number and variety of tasks which are undertaken by the small band of staff at the depot. It is felt that these might be of interest to some of our readers. 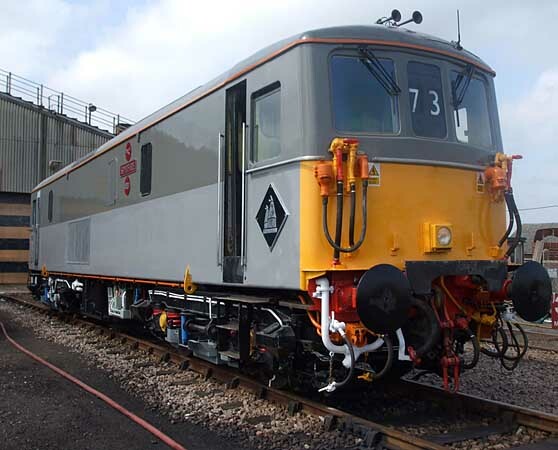 These works provide a steady income for the depot site and provide a source of revenue; some of this is used to offset the costs of storing & maintaining HDL’s fleet of railway vehicles. 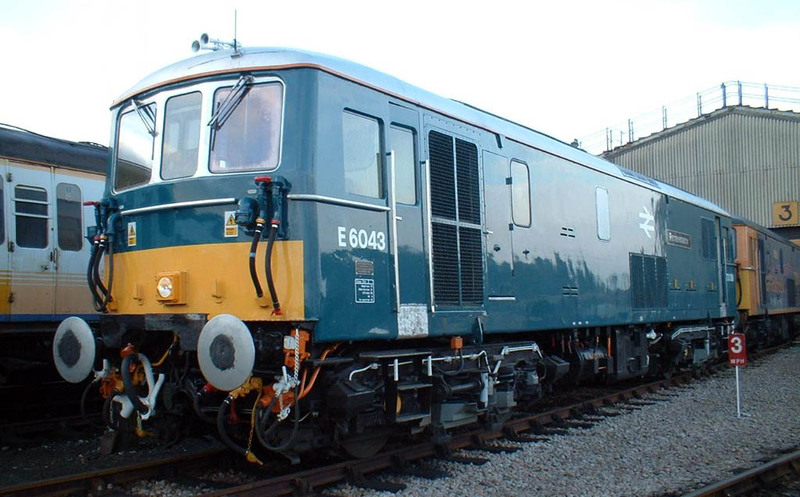 It should be noted that the activities described on this page are not those of Hastings Diesels Limited (HDL). Stabling & day-to-day maintenance of Southern’s Class 171 DMUs. 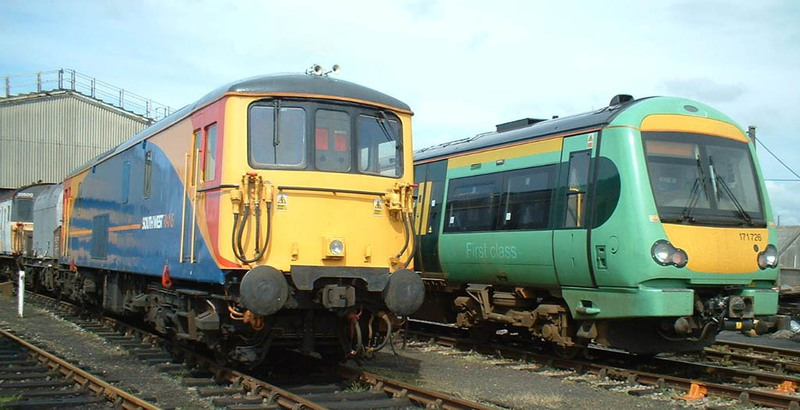 SLREL provides stabling facilities for four units of Southern’s Class 171 DMUs which operate on the Ashford – Hastings – Eastbourne – Brighton service. All refuelling is carried out at the depot, for which purpose a second refuelling point was installed. Every unit is cleaned and is given an ‘A’-exam every night, requiring a night-shift to be worked by some of the staff. Only for certain heavy works are the units sent to Selhurst depot. 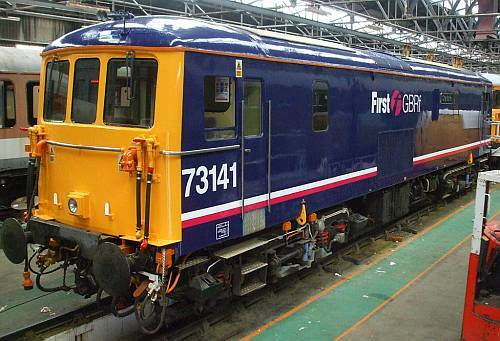 Servicing of Class 66 diesel and Class 73 electro-diesel locomotives for GB Railfreight. On the Class 73s this includes ‘A’, ‘B’ and ‘C’ examinations. 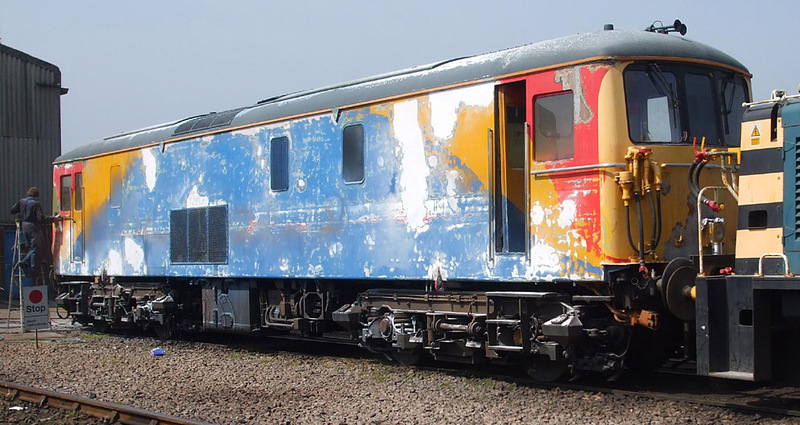 Assistance with maintaining the motor-coaches of Network Rail’s Sandite/De-icing DEMUs. 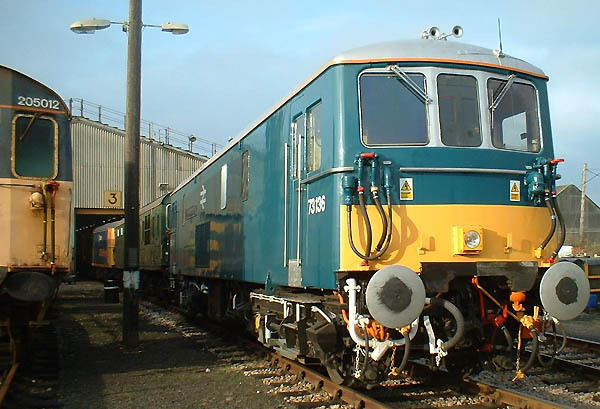 Above & Below: This pristine-looking Electro-Diesel turned up at St. Leonards Depot in the week of 27 November 2005; it was on hire to GB Railfreight. In the lower photo, behind the 73 can be seen HDL’s motor coach Hastings and another class 73, whilst to the left is Southern’s withdrawn DEMU 205 012 which was worked to St. Leonards Depot for disposal. 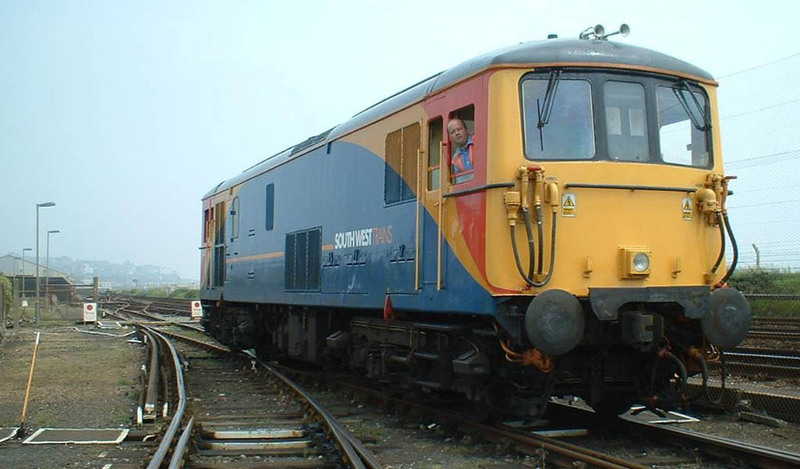 Above: South West Trains’s loco 73 235 paid a visit to St. Leonards Depot on 13 June 2006, to have its engine changed. (Readers with technical knowledge may know that the Class 73 has the same English-Electric diesel engine as HDL’s DEMUs.) 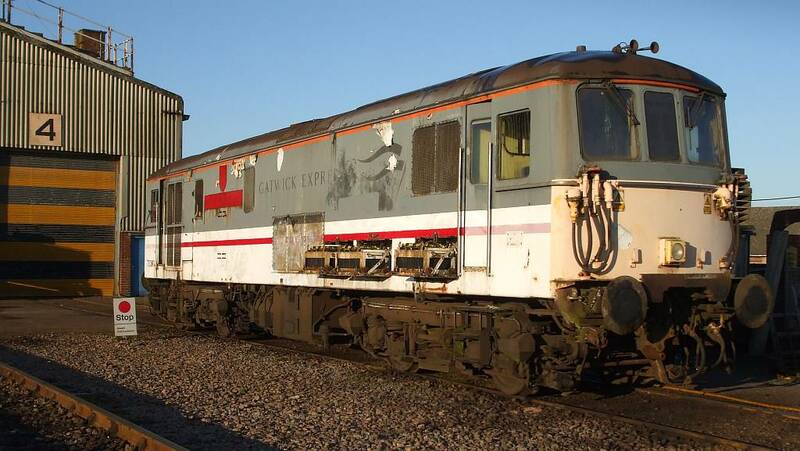 This particular loco was found to have a life-expired exhaust/silencer unit; as a result she stayed longer than planned whilst a new part was sourced and fitted. 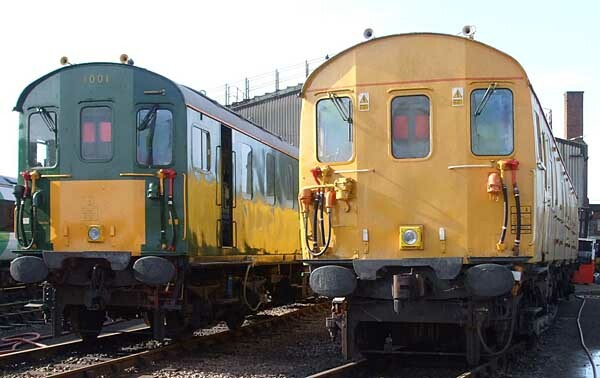 Above: On Tuesday 27 March 2007, Andy Armitage captured this non-DEMU line-up of vehicles in the yard at St. Leonards Depot. 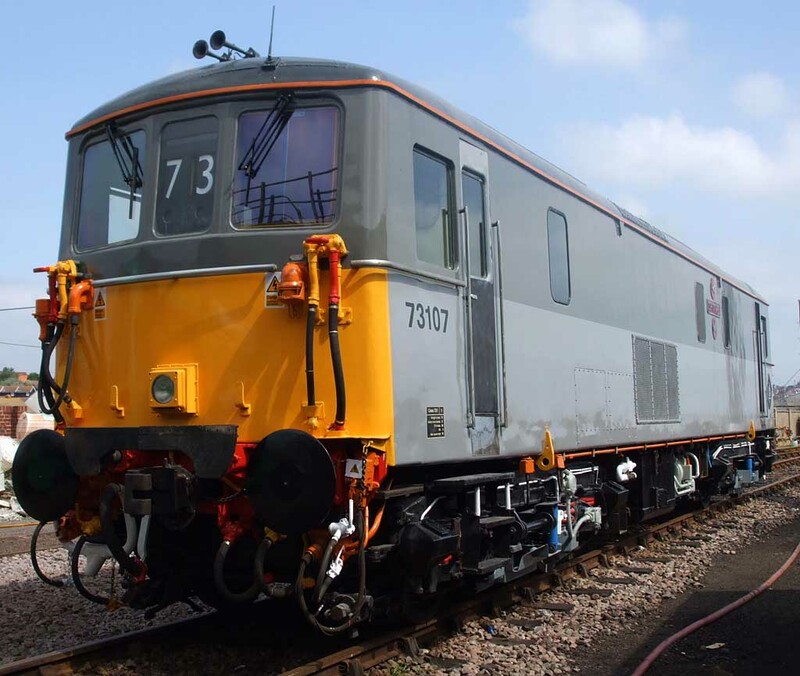 Of particular note is a pair of Class 73 Electro-Diesels in the all-over yellow livery of Network Rail. Above & Below: Electro-Diesel Class 73 locomotive no. 73 107 Spitfire arrived at St. Leonards in spring 2007 for overhaul. Its new owners, RTRail, had bought it following the disintegration of Fragonset; it turned out to have much more work needing doing upon it than was first expected. Andy Armitage took these views of Spitfire in the yard at St. Leonards when the job was completed. Subsequently this loco conducted three test runs coupled to our DEMU motor-coaches during September/October 2007. Four Motor Luggage Vans (MLVs) from the previous Gatwick Express fleet have been converted by Network Rail for use as de-icing trailers (they can no longer move under their own power), to prevent ice forming on the conductor rail of 3rd-rail electrified lines; they are based at Tonbridge and are numbered 68501/4/5/8. To undertake de-icing duties whilst being driven from their own cabs, these former MLV cars needed to be fitted with Speed Sensing Function. In the early part of 2008 this work was carried out jointly by staff at St. Leonards Depot and external contractors. Subsequently the four MLVs have returned from time to time for topping-up their de-icing fluid reservoirs. Above: MLVs sandwich a Class 73 electro-diesel loco which provides the motive power to the 3-coach train. Below: one of the MLVs meets our DEMU motor coach 60118 Tunbridge Wells. Photos by Andy Armitage. 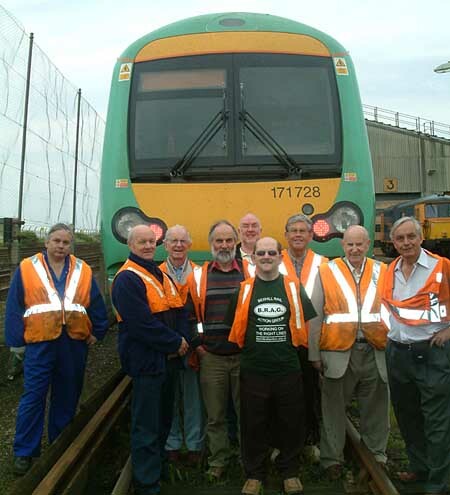 Members of BRAG visited St. Leonards Depot on 29 May 2008, by special arrangement. BRAG campaigns for the improvement of rail services and stations in the Hastings – Eastbourne area and beyond. Above: Andy Armitage (L) with the BRAG visitors at St. Leonards Depot yard. The live rail was not energised at this time. 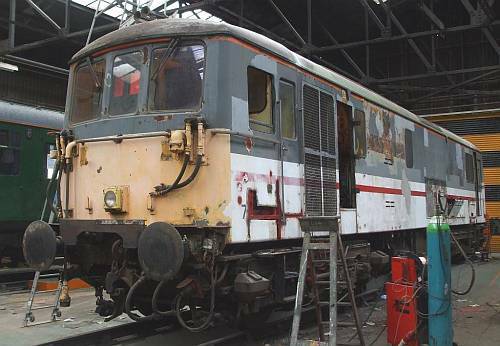 In early 2009, staff at St. Leonards Depot undertook a heavy overhaul of the bodywork of Class 73 electro-diesel locomotive 73 207 for First GBRf. This loco had been stored at Tonbridge, and was now required for use again. Above: 73207 used to operate the Gatwick Express service, as can be seen by the faded remains of its bodyside legends (10 December 2008). Above: Some MIG-welding of patches to the bodywork is under way in this view. 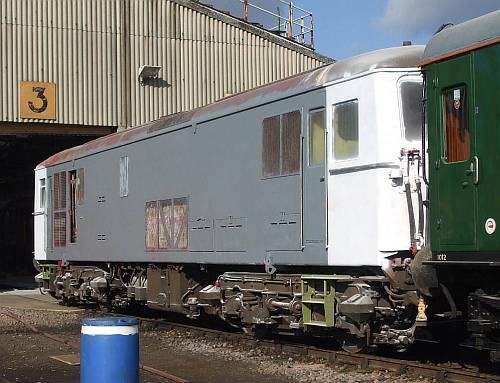 Above: The bodysides have been painted in primer, while every surface beneath solebar-level bears a dusty testament to the many rounds of filling & sanding which have been carried out above to achieve a uniform smooth surface! The loco has been dragged out into the sunlight by our motor-coach Mountfield. Above: Job done! The finished article basks in the sunny yard on 1 April 2009; alongside it is 66 708, and coupled-up to it is sister ED 73 208. Photos by Andy Armitage. Above: During a visit from Whitemoor for a routine exam, in mid-July 2009 this locomotive received some further attention: its radiator was cleaned out, it was given a further coat of Rail Blue paint, and it was equipped with the large arrow-logo as can be seen. 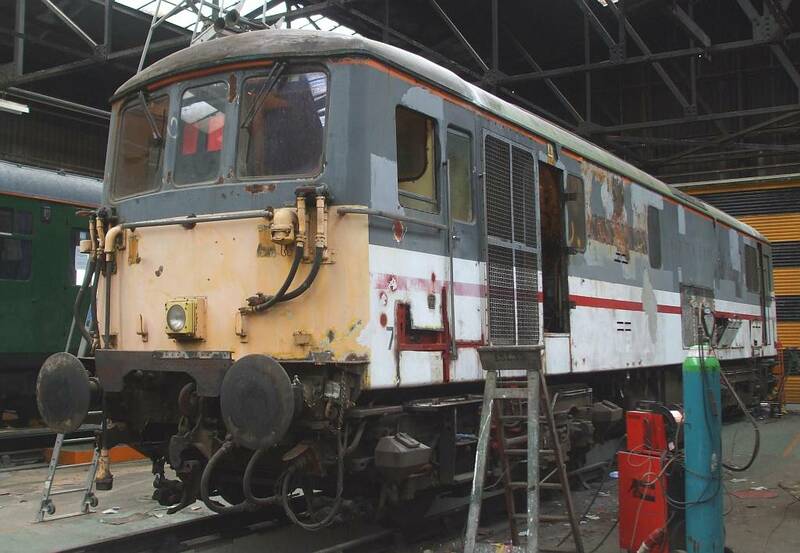 A further Electro-Diesel Class 73, number 73 201 was brought to St. Leonards depot for external refurbishment. Above: The loco in the depot before work got properly under way, and while it still sported South West Trains livery. Below: Out in the yard after the paintwork had been rubbed down and filled in preparation for repainting. 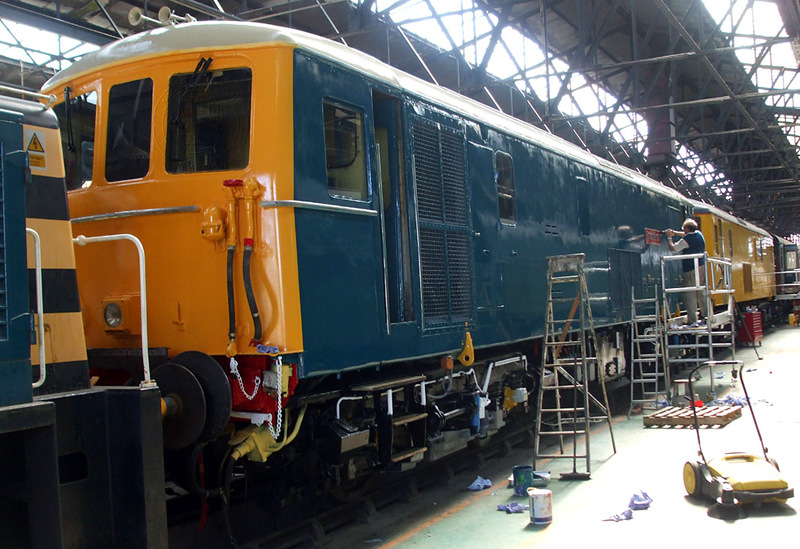 Above: Looking resplendent in its “BR Blue” livery. Below: Nameplate and crests added to the bodyside. 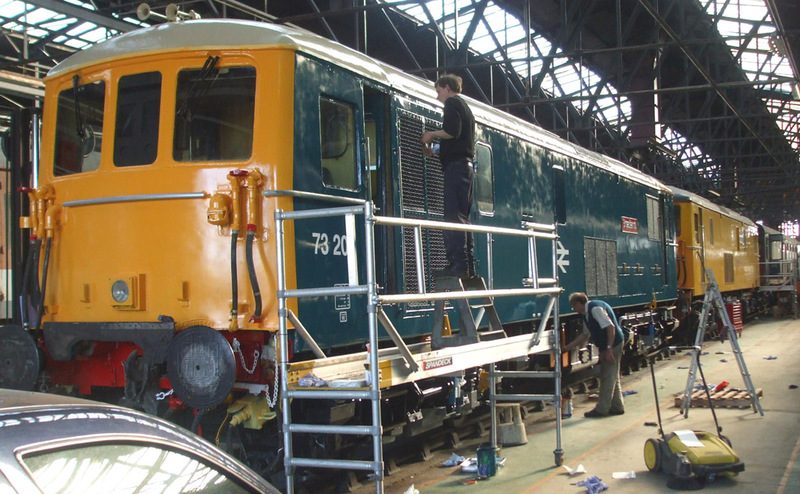 Above: Applying the finishing touches to the locomotive on Thursday 21 May. All photos by Andy Armitage. 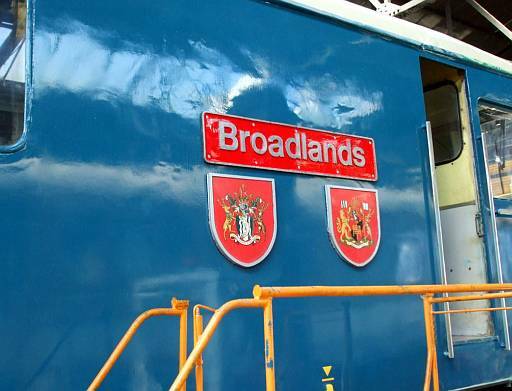 On the morning of Friday 22 May 2009, 73 201 Broadlands was completed, and departed St. Leonards Depot to run to Eastleigh for the Eastleigh 100 Centenary Open Weekend; its departure from our yard was photographed by Craig Stretten. 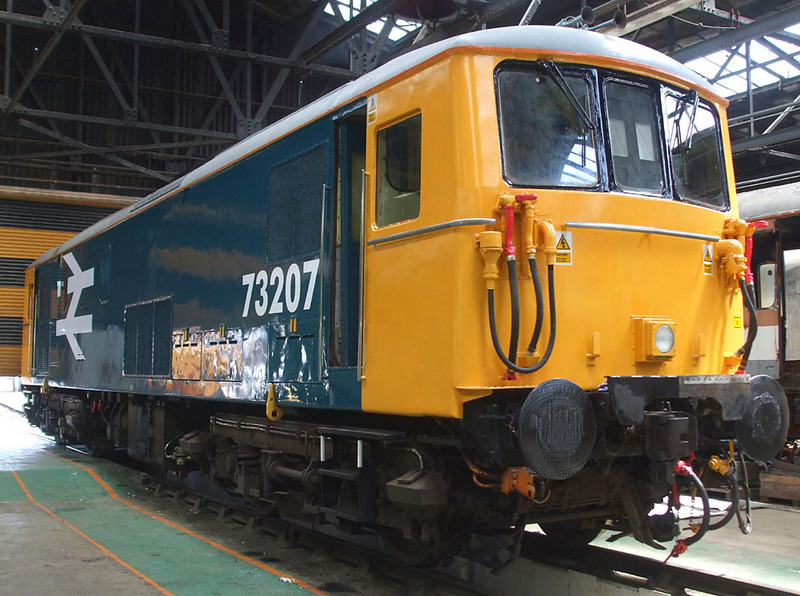 Above: Freshly-repainted class 73 locomotive at St. Leonards Depot. On Wednesday 8 July 2009, staff at St. Leonards Depot completed a repaint on Electro-Diesel class 73 locomotive 73 141. The following Saturday it was named Charlotte in a ceremony at Minehead. Please see the new article for a continuation of material of this nature.